Master your outdoor smart-city climate measurement. Accurate: Double-helix protection & precision. Maintenance free: Solar powered, no cleaning required! One year of prepaid data included: SigFox data reliability with automatic data logging. Maximum sensor protection and accuracy for cost-conscientious customers. Smart city wireless SigFox & LoRaWAN connectivity. The smart, smart-city home weather station. Patented helical technology offer high protection and very good accuracy. Titanium white outside is maintenance free, UV and impact resistant. No setup required - solar powered & wireless requires no setup. Professional durability and measurement accuracy. WMO precision with unsurpassed sensor protection from rain, snow, dirt & sand. 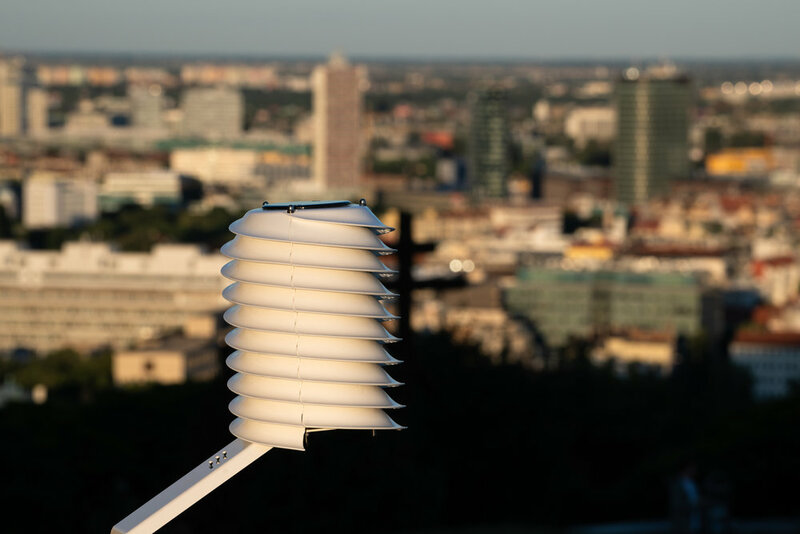 Smart city wireless SigFox & LoRaWAN connectivity. Patented double-helix technology offers unsurpassed measurement stability and precision. UV & impact resistant Titanium white outside is truly maintenance free. Impact resistant to hail and spider deterrent on the inside. High-reliability of SigFox data transmission.